Who would have thought that exponential growth in technology would result in appearance and rapid raising of drone industry. Everything from miniaturization of CPU, lowering costs of memory and especially advances in LiPo battery technology contributed to acceleration on bringing this technology into the hands of average person. It is remarkable that smart phones are indirectly responsible for development/improvement for most of technology that is powering modern drones. I don’t even remember when I first saw the first modern day drone. I guess it was on some news article from ArsTechnica or TechCrunch that I regularly check. But I do remember from childhood years about RC airplanes, that they were very expensive and hard to master/control. This two things have now dramatically change, as consumer drones are becoming cheaper by the day and easier to fly. But I wanted more then just a consumer drone from established companies such as 3D Robotics, DJI or Parrot. 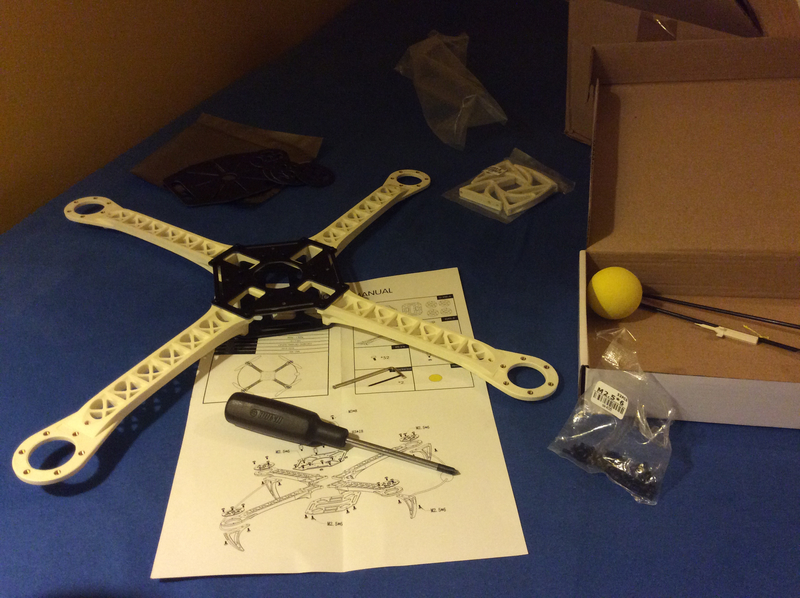 I wanted to build my own drone, so I could get first hand experience how various parts come together. I don’t want to just fly it, I want to understand how it works, I want to feel technology that powers this modern day Fenix. Now to get stared with something as complex as building your own drone, it is best to get some information from people that have actually build it them self. 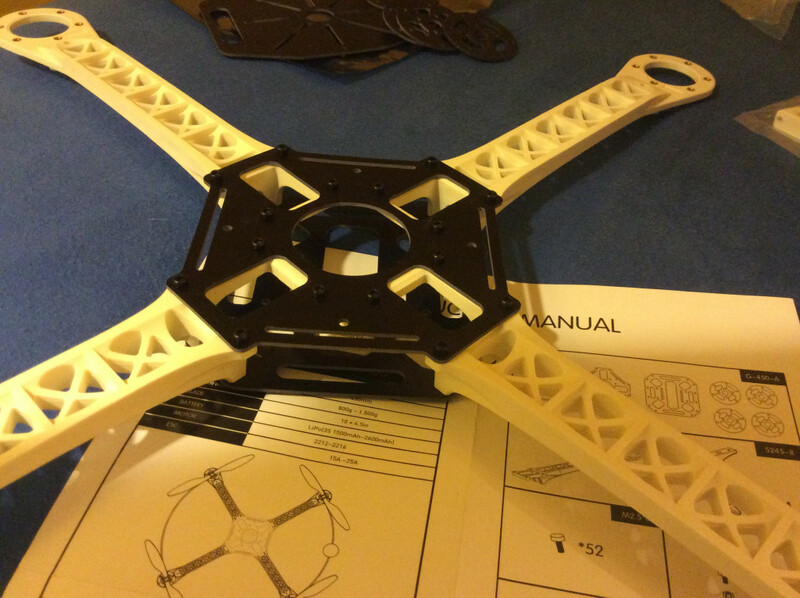 When I started on this project, I did not have any experience with quadcopter drones. Nevertheless, I found this great tutorial from Korey Smith. I think this a good choice to build your first drone, as the parts are not that expensive and the overall drone is pretty easy to build. The reason that I bought two additional motors and ESC (electronic speed controller) is that motors are quite vulnerable when accidents occur. Also when connecting for the first time ESC with motors, there is a good chance that you will short circuit the ESC (like I did), therefore it is nice to have a spare ESC laying around. Of course the most breakable part are propellers, therefore a quantity of 3 packages (4 in each package) is a must have. When propellers break, there is a high possibility that motor mount will also break (again this happened to me), so I have included one package in item list. It is actually pretty easy, just follow the instructions provided. Remember to not over tight the screws, otherwise you can damage screw head which makes it hard to remove it in the future, in case of necessary fixes. Yellow ball shown on the picture above is really a nice addition for orientation when flying the drone for the first time. Enough for today, join me in part 2 where I will show my (crappy) soldering skills and how I managed to short circuit the ESC. Hello. I am a software engineer. I live in a small town called Žalec, Slovenia. I write about stuff related to technology.